I am giving the link to this article to the county commissioner in order to simplify things. I am asking for some help before someone kills themselves. It involves both public health and traffic management. In some ways it seems to me to be amusing but that is because nobody has been killed to this point. We moved into our home 15 years ago this past August. I must say that I am happier here than anywhere I have ever lived. There are some areas, however, where if you are observant you can see signs of man at his most clueless. As this picture hints, our property is one of those places. We were told when we came here that there was a problem with drugs on the street. That may be so but we have only seen evidence of that a couple times unless you include alcohol. For the most part we have focused on our business and the other residents have done the same. However, there have been two problems that have been recurrent and they appear at the same place. Just on opposite sides of the street. This Google Earth view is a perfect view of the public health problem on the other side of the street. You can see our culvert on the right side and the ditch is dry. On the left side (northbound) of the street you can see standing water. That is a problem. It seems there is a low spot that holds the water there. The right side is dry within a few days of a storm. It is as much lower than the left side as it appears in this picture. Since this a google streetview I don't know when it was taken. The next photo I took today and it's been over a week since any significant rain. Perfect example of absentee owner. You cannot tell by the weeds but this is a channel that leads (one supposes) to Caney Creek. Certainly it is supposed to lead somewhere but I cannot say for sure where. It is pointed in the direction of Caney Creek. There is a channel cut to the right of the utility pole but the water actually does not flow. When it is stagnant it aids in the multiplication of pests. It has been the delight of our ducks but it also became a killing field when lowlifes began using our birds as targets in little games of vehicular duckicide/goosicide. When we removed the birds from the swamp I am sure the insect population exploded. The aforementioned lowlifes are a perfect introduction to the second problem. There are squirrels driving vehicles up and down Tommy Smith Road. This is the infamous Tommy Smith Curve. It is known (albeit prematurely) by some residents as Dead Mans Curve. There is a reason for this.There is a type of driver who is known by law enforcement officers as a squirrel. These squirrels see a need to exit the curve at speed. The challenge then becomes to go as fast as possible and pick the last moment to brake and stop for the highway. Over the past few years there has been an increasing number of them who find themselves unable to maintain control of their vehicle. We are the second house down from the curve and seem to be the most frequent crash site. These tracks look like a vehicle drove up to our culvert, backed up, and drove to it again. Nope. To get a good idea of how vehicles can make these tracks go see a movie about rally cars or a more recent one on drifting. This car was crossed up and sliding. It tore our culvert partially out of the ground, went airborne, left it’s taillights embedded in the corner post, lit in the soft ground and obviously still had plenty of headway. It made deep trenches in the ditch and reentered the street just missing our mailbox. I am happy the Gene pool was not altered by the driver. I am also happy he stayed in the ditch. He came close to going through our fence. I decided I needed to do something this time and my first concern was the animals who like to stand up front and watch the silly humans. I am no expert at photoshop so some things in this picture are hard to see. 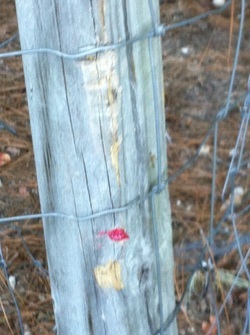 I put this fence about fifty feet back from the road. The llama and the donkeys can watch the humans from a little greater distance. I don't care if a drunk ploughs into my fence. It will probably hurt the car worse than the fence. However, I have developed a pretty deep affection for the donkeys and llama. We developed solutions too late for the geese and some ducks. I suppose it goes without saying but we also have actual human children on the street as well. There are 3-4 children who live two houses down on the right side of the street. They are about the height of our geese but their parents probably hold them in even higher regard. This corner post which was just barely scraped is evidence of how close we came to having a llama that was perhaps panicked and running up and down the road. The little red dot is part of a taillight lens. This is where they regained access to the road after digging a trench in the ground. This picture is misleading as the gouge between the two tracks is over a foot deep in spots. If not for kinetic energy the car might still be there. That's the mailbox that you see in the center of the top border. They just missed it. As you will see in a moment, it is sturdy. Had they hit it they probably would have been stopped. Our neighbor saw this happen. They stopped down at the 2090 intersection and were pulling parts off the front of their car. They saw her and quickly left. There is a reason this mailbox has a base that looks like a WW2 tank trap. The post and the box are both made of heavy steel. They serve to block damage to the box beside it. A car hit them years ago and sent them flying a considerable distance. 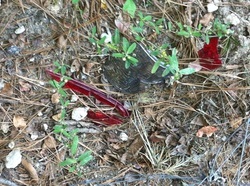 We don’t know who did it but they left automotive fluid and body parts behind. I then constructed the concrete base and a Ford Taurus sent it and the mailbox flying all the way to the next driveway. It is twisted due to that episode and it wears it's scars proudly. I just dug another hole and set it back in the ground. There were no boxes open at the post office so we just put up with it. 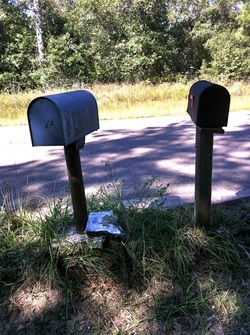 Actually motorists apparently began to respect the mailbox that would not die. It hasn’t been hit by a car for years nor have I seen any broken baseball bats. I spoke to a police officer before I installed this. The trick is that it is not designed to hurt anyone. It is designed to survive after being treated most foul. I make all repairs with that in mind. Your creations must break and not be designed with the intention of hurting a person. The potential is there for something nasty to happen. The situation has improved since the “hole in the wall” bar down the street closed. That is the actual name and not just applied by me. That bar was owned by a couple of nice guys that helped me corral my Llama when he escaped. However, they didn't do traffic safety any favors. If I understood the story correctly this tree is scarred because a drunk went off the road and hit it. I know he was drunk because of interaction between him and my son in law. The driver seemed upset because the tree had gotten in his way. There is no limit on how strong trees can be. I'm happy it was there. My SIL was upset because this is the corner of the house where both my granddaughters sleep. I, of course slept through the whole incident (our home was first and sets back from the road). It is times like this that make one wonder how long before some errant driver thins the herd of squirrels. I suspect the tragedy will occur when someone goes off into the opposite ditch. I have pulled a truck from there with my pickup. It stayed on it’s wheels. I haven’t seen one flip yet but if it does the standing water will do more harm than just breed mosquitos. Luckily this area does provide at least one spot where a Law Enforcement Officer could sit with his radar and contemplate the situation. This driveway is to a home that was destroyed by a tree during hurricane Rita. It is virtually across the street from us. I expect this year will be like all others. There will be a fresh crop of new drivers from the nearby high school (Caney Creek) trying to prove that they are bulletproof. This driveway is hidden from the view of northbound traffic until they are in the curve. There is another, I believe, just down the road for observation of southbound traffic. Motorists are full of unfounded confidence and, especially when the pavement is wet, it is treacherous. Just seeing the occasional police car slows things down tremendously. I really doubt this was intentional. Our neighbor saw the incident. They stopped down at the 2090 intersection and were pulling parts off the front of their car. They saw her and quickly left. My intentions are to continue to maintain my property and live peacefully. The culvert was pulled from the ground and much of the crushed concrete on the top of the driveway has disappeared. The driveway was set to erode rapidly by this little incident. The cinderblock is weak enough to break if hit by a car. The concrete was poured in place dry, therefore, it will be less strong than normal concrete. I will cover it with dirt and that will help the appearance (as in make it disappear) I will find other uses for the concrete rubble if it is hit by a car. Giving the squirrels reason to pause and avoiding being sued are high on my list. Someone tell me again why squirrels drive.